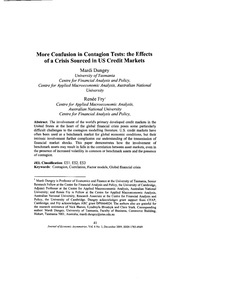 The involvement of the world's primary developed credit markets in the United States at the heart of the global financial crisis poses some particularly difficult challenges to the contagion modelling literature. U.S. credit markets have often been used as a benchmark market for global economic conditions, but their intrinsic involvement further complicates our understanding of the transmission of financial market shocks. This paper demonstrates how the involvement of benchmark assets may result in falls in the correlation between asset markets, even in the presence of increased volatility in common or benchmark assets and the presence of contagion.